In a bid to outdo the Dominar’s previous feat of traversing Siberia under the ‘Trans-Siberian Odyssey’, Bajaj Auto has flagged off another epic trip. Called the Dominar Polar Odyssey, it will see three riders travel from Anchorage, USA to Tuktoyaktuk, in the Arctic Circle before heading down to Ushuaia in Argentina, the northern tip of the Antarctic Circle. During the course of the journey, the riders will cover over 50,000km across 17 countries in North, Central and South America. The three riders, namely Deepak Kamath, Avinash PS, and Deepak Gupta will be covering more than 450km everyday over a span of four months. Moreover, they won’t be accompanied by any dedicated service support or back-up team. The three Dominar 400 motorcycles have been modded with knobbies, raised front fender, full crash guards with integrated jerry cans and touring windscreen. Bajaj has also equipped them with ergonomic seats, handguards, radiator guard and hard case panniers on both sides and up top as well. The front telescopic forks feature gaiters to protect them from dust and muck. The powertrain, however, is stock, just to prove the fact that the Dominar is capable of accomplishing such a feat without any enhancements. 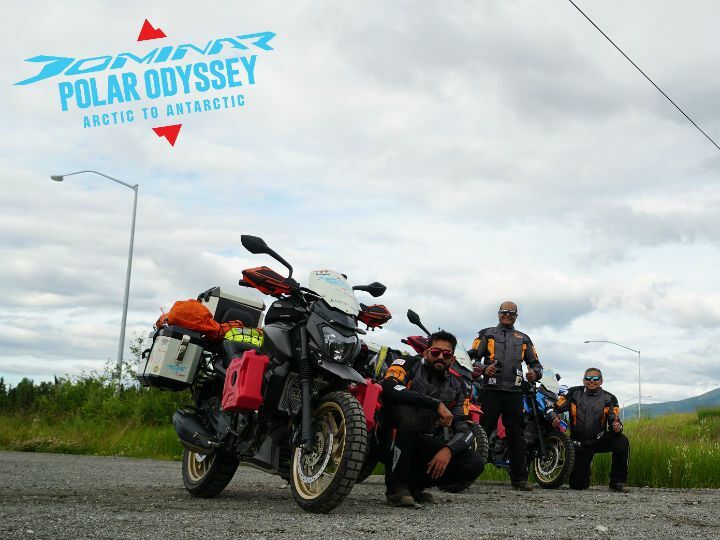 Anchorage (Alaska, USA), 30th July, 2018: On the 1st anniversary of the historic Trans-Siberian Odyssey which made the Bajaj Dominar 400 the first and only Indian motorcycle to conquer the world’s toughest journey, the Bajaj Dominar 400 is set to outdo its own record. The Dominar Polar Odyssey – Arctic to Antarctic will cover the entire length and breadth of North and South America commencing from Anchorage to Tuktoyaltuk in the Arctic Circle and then all the way down to the End of the World at Ushuaia in Argentina by the Antarctic Circle. The Polar Odyssey challenge is being taken up by three passionate riders - Deepak Kamath, Avinash PS, and Deepak Gupta. Deepak Kamath has been riding for over 30 years now and was part of the Dominar Trans-Siberian Odyssey. Avinash is a mechanical engineer by profession and an avid motorcyclist and photographer. Deepak Gupta is an active member of the Group Of Delhi Superbikers (GODS). Bajaj To Launch Electric Two-wheelers By 2020?